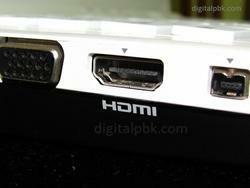 HDMI or High Definition Multimedia Interface is a new technology to connect Multimedia devices like laptops, DVD Players and TVs. It is capable of upto 10 Gbps transmission of High Definition Videosin Full HD Resolution (1080p). 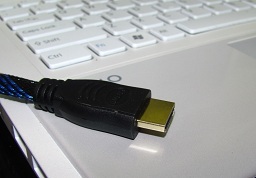 Unlike other ports that connect to screens like VGA, SVideo, the advantage of HDMI is that a single cable connection carries both the audio and video channels. The picture shows an HDMI port on the new Sony Vaio CW laptop. You can get this cable for under $10 or around 400 INR. As for a short note regarding the HDMI cable buying guide, Quality of the HDMI cable is critical as it has to carry high frequency signal. So look for a properly shielded, High quality HDMI cable. Now the other HDMI capable device here is an LG Scarlet 32 inch LCD TV. 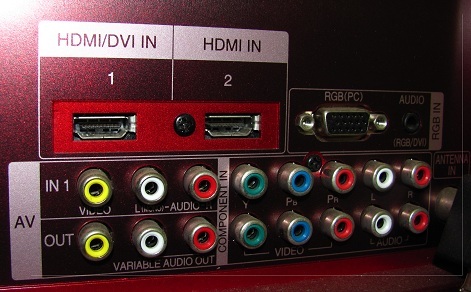 The following picture shows the available input ports behind the LCD TV. We have to plug in the one end to the laptop and the other end to the TV's HDMI port, which is not pretty hard to find as shown in the picture above. The HDMI port is top left and has two ports. Among the other ports are S-Video, VGA RGB and component in (RCA). Now you should be able to set a proper resolution for your other device like the LG TV as shown. If your device is not detected click "Detect Displays". How to remove hdmi from laptop? To remove the HDMI cable just unplug the cable. There is nothing to unmount like in a USB. You can remove the HDMI connector from the laptop. Don't have an HDMI port? I have successfully connected my 32" Fluid flatscreen tv to my Acer via HDMI port. I have my display on Extended Mode and resolution of the TV at 1920 x 1080. However, the screen is not sharp at all, it is very straining to read. I think one of 3 things is happening: either the display is squeezed/stretched, or there is a problem with the connection/communication, or the laptop is not capable of outputting a sharper resolution. Any suggestions or tips or information about what is happening? Windows + F7 usually cycles through the modes. Give it a try. Check your display settings to see if you're connected in "extended mode"
See if you can drag your applications off your laptop screen and into the TV. You can switch to cloned mode, meaning the same screen on both laptop and TV by pressing Windows + P and select Duplicate. I can get my laptop on the tv... but its a still shot of just my acer desktop background??? I am frustrated and not very good with this stuff. Thanks for the help and support... How do i play a movie or just show the screen instead of just the background?? Is ur laptop screen running on extended mode? Hi Jeff, the second HDMI monitor might be running in extended mode. This means you can drag your applications from your laptop monitor to the TV which was connected using the HDMI cable. To change this you can go into Display settings and change it to cloned or duplicate mode to see the same desktop in both screens. Alternatively look for a shortcut on your keyboard that changes display modes. It should look something like a screenand it is usually found on F7 function key. However I tried again recently it has just stopped working. The TV recognises something is connected but says no signal, the laptop doesnt recognise anything, even after switching the output screens. The cable definitely works as I have tried it with a PS3. I'm having this same problem. I had my computer hooked up to my LG TV via The HDMI Cable. It always set up automatically, It was working fine last night, I did not disconnected it from my laptop though I still had it connected to the TV, I just put my computer in hibernation for the night and turned off the TV. Now when I get back on my computer and turn the TV on it says it's connecting but then says there's no signal idk whats wrong with it. I've tried shutting down the computer, disconnecting it from the TV, switching inputs on the TV, and unplugging the TV but nothing has worked. My computer acts like it is connecting to the TV but the TV never gets any signal, and the HDMI cable is fine because I just connected my dvd player to see if it was working and it is. If anyone knows how to fix this please HELP! Thank you! I have the saaame roblem. I have the saaame roblem. Worked-- now no signal. If you found a solution let me know. Guys, I just fixed this when I had exactly the same problem. I just uninstalled and re-installed the display adapter driver. Hope this helps you too. WOOHOO! I got the following cables from the shop? ?Is any other cable I need to buy?? Please help me on this!!! and where can i get it in Mumbai and for how much approximately,. thank you. After connecting my Acer Aspire 7535G to a TV and messing around, trying to get sound to work on the TV, I finally got it working. This was a few weeks ago and, more recently, I have found that, if I don't shut my laptop down (ie. close the lid and put it to sleep), my laptop screen shows screen 2, with all my icons, start bar and start menu out of view. When I connect it to the TV again it sets it as screen 3 and still has the laptop screen as a secondary screen. In order for me to sort it easch time I have to drag all of the icons from the unseeable primary screen onto this secondary screen (what the laptop displays) and go through control panel, but this problem keeps occurring! Does anyone know how to sort this, or whether anyone else has had a similar problem? i recently bought a Sony bravia CX52. The only issue im having is with dell inspirion 15r. my another laptop of Acer connects nicely with TV. but the DELL is not even being detected. help required!! Im trying to connect my laptop with my tv and it works great but is there any way to have a stationary screen on the tv but be able to use my laptop without distrupting whats on the tv. For example can i use netflix and have it playing on the tv and then be able to pull up an internet window without it showing on the tv? I have a Sony TV model KDL46V-3000 and I seem to have an issue with the HDMI 1 input slot in the back of the TV. The HDMI 2 slot works fine with the cable box, PS3 and even the laptop, when they are connected, but number 1 slot does not. The screen stays black when I connect the cable. What could be the problem ? Thanks. I have a sharp aquos 32 inch TV and I've been trying to get my toshiba laptop connected so that I can watch some HD movies and TV. I'm connecting it with an HDMI cable. I can get the picture to display on my TV, however I cannot get the resolution correct at all. The 2 obvious choices are 1920 x 1080 and 1280 x 720. However, with both of these resolutions there will be part of the screen hanging off the top and side of the TV so that I can't see the full picture. Trying other resolutions with result in there being large black borders around the edge of the screen and fonts appearing 'squashed' so they don't read correctly. It seems like it should be an easy thing to fix but I just can't fathom it out. Anybody encountered similar problems and have a solution to this? I have a very similar problem. In the beginning, I was using a VGA cable (worked great) and audio cable but realized I had an HDMI cable that came with my TV and wanted to try it since it seemed simpler. When I plug in the HDMI, the sound works fine, but there is an overflow of my start menu button and pretty much the whole screen, so that I can't see it (when using projector only - I have played with resolution and it only worsens the problem). When I try to duplicate screens, it thinks I have outputs 1/2 in my laptop and 3rd as my TV. Any ideas on how to get rid of the duplicate output in the laptop and the overflow of everything when using projector only?? Hi there, thanks for the guide, I was able to connect it up properly. The only problem I have is the quality of the image. When i try to play a HD 1080p movie from my laptop using the extended screen, the image is clear as expected, but it lags quite badly. How can I fix this? Your HDMI connection can be thought of as an extension to your screen. So you can play or browse or watch movies on your TV with the HDMI to HDMI connection. The sound also gets played on the TV, so both audio and video are carried by the HDMI cable which makes movie viewing or playing games possible on TV without the need of additional cables. Sound and picture quality depends on the content you are playing on the laptop and the capability of your TV, HDMI is capable of transferring high quality video and audio content and would not degrade any quality while transferring unlike other modes such as VGA cables or RCA cables. I have read people complaining that the picture size on their lcd tv is small while playing it through their laptop via HDMI cable. Maximum resolution of my laptop is 1360x768....is it enough to get the full size picture on my 32" lcd tv considering the fact that I play only HD movies[720p/1080p] from my laptop or do i need a 1920 x 1080 resolution. PS: MY PANASONIC VIERA IS NOT "FULL HD" AND ALL THE MOVIES PLAYED FROM MY LAPTOP WILL BE HD[[720p/1080p] ONLY. 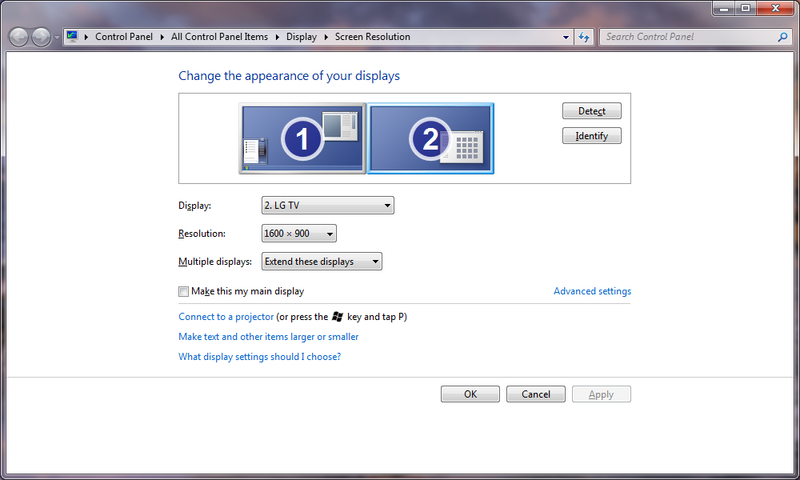 Resolution on your TV should not be set to the same resolution on your laptop screen. 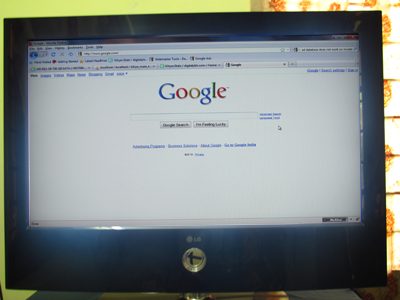 For this, first make sure you dont clone the screen to the TV instead use the extended desktop mode. In this mode you can change the resolutions of the laptop and TV independently. Hello. Um.. After I have connected my Toshiba T210 Laptop to my Sony TV, it became successful. But then, the screen appearing on the TV is too small. I have adjusted the setting on our TV, changing it to wide zoom. But still, it doesn't consume the full screen of the TV. I would like to enjoy the full view of my 40 inch tv, not just half of its screen. I hope you understand my concern. Please respond. This mostly happens when you are giving a low resolution output to the TV. 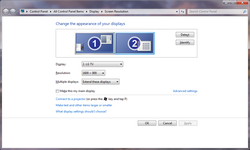 Can you check if the screen resolution on the second screen is given high enough that can be supported by your TV ? If your TV is FULL HD ready, it should support 1920 x 1080 resolution. Hello, I get "No Support" when I connect my hdmi from laptop to tv. I tried reinstalling driver and reinstalled windows 7 but no answer. It was working fine, but I connected the VGA to my friends TV, then I came back home and tried connecting my HDMI to my tv but it stopped working. Any answer on how to fix it? I have Toshiba Satellite L650D laptop, windows 7 64 bit. Try changing your screen resolution? Hi I think most probably you are running on a resolution that your TV cant support. Change the HDMI screen resolution, give it a shot. Hi, when I connect my laptop to the tv, it happens that there is image but no sound from the tv. In the sound devices in my laptop I can see the Digital Audio (HDMI) device but somehow the sound is still played by my laptop speakers. Advice on how to solve this would be great as many seems to face similar issues. Thanks. Have Sony Vaio laptop which I use HDMI cables to other Sony Bravia tv with no problem but when I try to hook up to Internet TV - I have no sound . I've made several attempt - swithcing HDMI set up from 1 to 4 but nothing. my laptop is Sony and I not have entrance of HDMI, just the lift entrance like the picture in this page. I need the cable for left entrance to connect with TV, and in my TV have a entrance of HDMI. do you have this cable or not or wher can I find it? No HDMI output port on laptop? I think what you are referring is that you do not have an HDMI port on your laptop, but have an HDMI compatible TV. I think you wont be able to find cables for these types. You may find converters which is not useful if your TV has other modes of input like the VGA cable. Anything on How to Connect Laptop to Home Theatre via HDMI? Hi Arun, I am trying to connect my laptop with HDMI cable to my sony dav dz310 home theatre, but in both cases (laptop and home theatre), they don't recognize the hdmi connection. Can you tell me what settings do i need to select on laptop or theatre so that it can recognize? I m running Windows 7 32 bit, Dell Inspiron 15r. I am using this home theatre with 3.5 audio jack and it's not delivering a great performance via the port because i've listened the theatre from USB drive and DVD/Cd and it's just fantastic and I just want to feel the same when I play games on Inspiron 15r. Your response will be invaluable to me. Hi KK, Please see the specification of the Sony DAV-DZ310. Note that it does not have an HDMI input port, but just an output. So connecting laptop to the sound system does not work since, you are connecting output of your laptop to output of the Home theatre system.